Curriculum renewal took center stage in late January, generating enthusiasm in a well-attended public forum. About 100 faculty, staff and students heared presenters discuss ideas to integrate the structure of the scientific-foundations phase of the medical student curriculum. Many more tuned in online from throughout the WWAMI region. The goal is to begin the new curriculum in fall 2015. Medical student presenters Kirsten Day, Ryan Smith, Navpreet Sidhu and Keiran Warner. ​Twelve of 13 full proposals were vetted. Tom Montine, committee chair and chair of the Department of Pathology, hosted the event and introduced presenters. Keiran Warner, a second-year medical student, opened the forum. 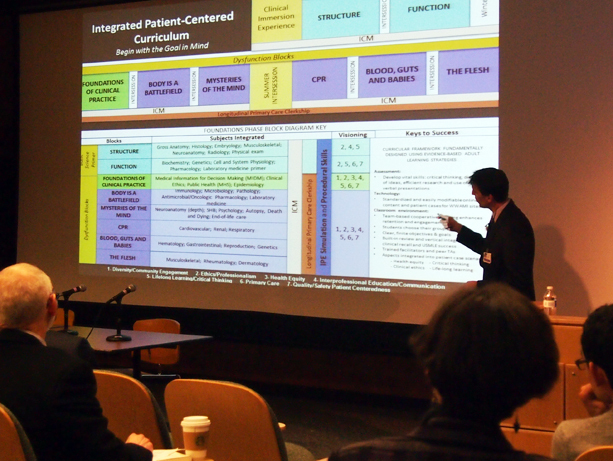 “The UW is known as an institution able to make big, radical changes,” he sadid in introducing a proposal for an integrated patient-centered curriculum. He cited the WWAMI program and the Colleges program as two examples. Proposals came from students, faculty, staff and residents. Tim Robinson, interim assistant dean for first year at WWAMI Wyoming, conferenced in from the Laramie. Larry Kirvin, assistant clinical dean for WWAMI Wyoming, joined from Buffalo. Second-year medical student and presenter Lauren Benson traveled from Spokane. Jane Shelby, assistant first-year dean for WWAMI Alaska, along with colleagues Bob Furilla and Cindy Knall, traveled from Anchorage. The next day, the full Foundations Phase Committee met to consider the 13 full proposals at a retreat led by Montine and modeled on National Institutes of Health study-section protocols. Proposals were ranked and re-ranked on strengths and weaknesses. Comments and assessments were considered carefully from non-committee members who had weighed in on a Catalyst website during a public comment period. Final proposals may be based on an individual submission or a blend. The Foundations Phase members will submit recommendations to the Curriculum Renewal Steering Committee this month. Public comments on the recommendations will be elicited broadly through town hall meetings in March open to all. Once a structure is decided upon for the Foundations Phase and other aspects of the curriculum, development of content will commence. All proposals and a video of thepresentation session can be viewed online (with UW NetID). Contact Michael Ryan, associate dean for curriculum, at mjryan@uw.edu with questions.